It seems that this fall has brought us a number of dangerous threats as ransomware infections, such as Seven_legion@aol.com Ransomware, seem to emerge almost daily. This threat however is not a new invention; nothing revolutionary. In fact, we have found that it is based on the CrySIS Ransomware engine just like the recently published and identical Melme@india.com Ransomware and Age_empires@india.com. This is a major hit to your computer because all your important files, including photos, videos, text files, and program files will get encrypted, i.e., will become inaccessible for you. The only way for you to be able to recover your files would be to get the private key from these criminals. Obviously, these people want to extort money from you for this key and possibly a decryption tool. The sad news is that you have no guarantee that you will get anything even if you transfer the ransom fee. The good news is that we can help you if you want to remove Seven_legion@aol.com Ransomware, but this will not bring your files back to life. The most likely reason for you to experience such a serious hit is that you opened a spam e-mail with a malicious attachment. Of course, not only did you open this e-mail but most likely you also downloaded and opened the attached file. It is not even too difficult to fall for such a spam mail if you consider that even your spam filter cannot detect it. These mails could have legitimate-looking senders, for example, as well as urgent-sounding subjects, which would not let you hesitate. Imagine that you see a mail in your inbox that has a subject like “Re: Unsettled invoice #11092016JKLL,” “Mail delivery error,” or “Re: Your hotel booking – problem with credit card details.” Do you think you could stop yourself from opening it right away? Most likely you would jump to view the attached file right away, right? Well, wrong, unfortunately. Because the moment you open this file is the moment you doom all your files. We hope that it is obvious now why you should be ever more careful when clicking on mails in your inbox and saving attachments. The biggest problem with ransomware programs is that by the time you realize their presence it is already too late to act. In other words, even if you delete Seven_legion@aol.com Ransomware, this will not save your files from encryption and will not decrypt them either. After you activate this threat, it targets the usual personal files, such as your documents, photos, videos, and other third-party program files. This ransomware uses the RSA-2048 algorithm which is a serious encryption method and virtually impossible to decrypt without the private key. This key is obviously kept hidden on a remote server, which can only be accessed by these criminals. All affected files get a new extension: “.id-A26F16D0.Seven_legion@aol.com.xtbl.” A text file is also created in all the infected folders named "How to decrypt your files.txt," which is indeed the ransom note. The information of this note is practically identical with that of the image (“C:\Users\user\how to decrypt your files.jpg”) that replaces your desktop background once the job is done. You are supposed to contact these crooks by sending an e-mail to seven_legion@aol.com. In a response mail you should get further details about the money transfer. We can only tell you that we assume these criminals demand the fee to be paid to a Bitcoin wallet address as usual. The amount could be anything between 0.1 to 1 BTC generally, which is around $62 to $620. Although there is no tool on the web yet that could decrypt your files, we still do not recommend that you pay these criminals a cent. Unfortunately, you cannot be 100% sure that you will really get the private key and the decryption software. The only legal alternative for you is to use your backed up files from an external drive if you have any. Hopefully, more and more users understand the need for such a backup because in such a nightmarish attack this could be the only hope for you to restore your files. If you have made up your mind, it is time for you to act and remove Seven_legion@aol.com Ransomware from your system. This infection can use a random file name, which could make it a bit difficult for you to identify but not impossible, of course. Please follow our instructions below step by step to make sure that you delete Seven_legion@aol.com Ransomware in its entirety. If you are not an experienced computer user, you may want to choose an automated method to do all this work for you and more. With a reliable up-to-date anti-malware program you can protect your files and your operating system from all known malware infections. For best results, always keep this security tool active and updated. Remove all instances of "Decryption instructions.txt" file from the affected folders. 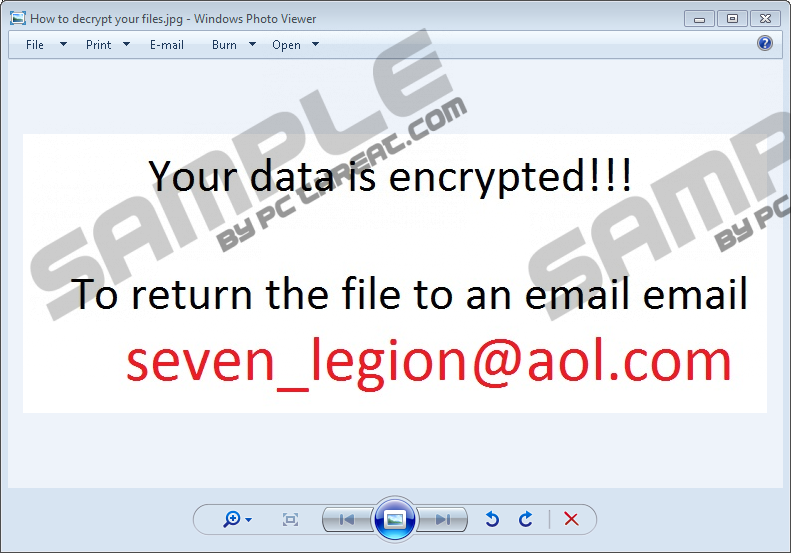 Quick & tested solution for Seven_legion@aol.com Ransomware removal.